Are you looking for best carry-on garment bag with wheels? 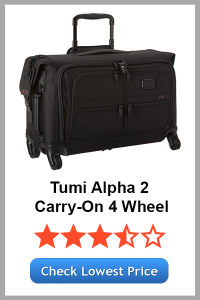 We are hearing a lot about the discussions going on for selecting the best carry on luggage for suits and garment bag that comes with wheels from our regular readers. So, we decided to take a survey in which we asked our readers and our followers to let us know about their choice. We got an enormously positive response. So, here in this post, we have compiled a list of best rolling carry on garment bags for 2017 that you can find on the market right now. We consider it the best of all because of its craftsmanship. You can see the appealing look of this bag and can fall in love easily with it. You can say that its cost is a little bit higher than usual but believe us, it is worth it. If you are one hell of a serious traveler then you will not regret buying this bag. With a perfect size of 12 x 14 x 9 inches, it offers convenient packing for most of the travels. 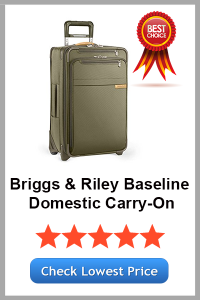 It is a perfect family luggage offering organized packing of all types of stuff. The product comes with lifetime warranty. This is rarely available with other luggage. The interior is spacious offering enough space for packing. It is lightweight yet big size bag. The side handle makes it easy to carry even when the weight is slightly more. It lacks spinner wheels at the bottom. Hence dragging can be slightly difficult. The design is simple and not a modish one. Travelpro is one of our favorite brands. It makes the things possible that no other can ever do. Its size is common to airlines in the United States. But in reality, the bag is bigger than it sounds and in many cases, this can be annoying. This was one of the reasons why we couldn't throw it at the top of this list. But for most people, it may not be a deal breaker. 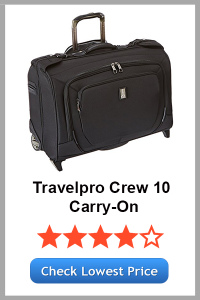 The weight of Travelpro Crew 10 is 10lbs and is heavier if we compare it to other bags in its range. But don't worry that's what wheels are given for. You can easily travel with this bag. But due to a slightly bigger frame of the bag. Sometimes you have to squeeze the bag a little bit to fit it in the desired area. The luggage comes with good dimensions of 22 x 15.5. x 9 inches. With a 10lbs weight, it can be conveniently carried too long distances. The wide framework offers some additional space for packing stuff. The bag appears compact but offers enough space to pack items. It comes with spinner wheels that make the movement smooth and flawless. If you want to pack extra stuff then you need to squeeze the bag slightly. As a result, this can hamper the shape of the bag. 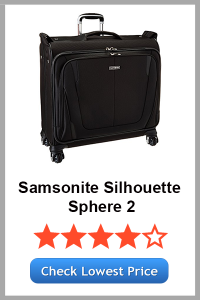 Samsonite makes amazing products and this is same as this garment bag. It is constructed of 100% nylon and is very durable. You can check out the lots of positive reviews and ratings that it has received worldwide on the internet. Fabric lining on the cloth of the bag makes it look damn attractive. It was one of the best selling wheel garment bags on the Amazon. There are many advantages of having this bag but compatibility with the airlines' rules is not one of them. One of the main reason is the weight. So before flying around anywhere in the corner of the earth, make sure that it complies with the luggage policies of that airlines and country. The bag is prepared from high-quality nylon. It is highly durable and delivers long-lasting performance. The exterior of the bag is attractive. With numerous compartments and sections, it offers organized packing of the stuff. It has a handle at the top as well as the bottom. This makes carrying it very easy. It comes with grip handle and spinner wheels that add to the convenience. The weight is slightly more and may not comply with the airlines guidelines. It is prepared from fabric. Hence, it does not hold excellent resistance to scratch and water. This is one of the best premium wheeled garment bags that you can find on the market. Don't turn away from it by just looking at its price. It has a lot to offer. It is stitched up top to bottom from ballistic nylon. The size of the bag is half an inch more than the normal ie 22x14x9 inches. It has four smooth-rolling wheels so you can say it is very easy to carry around. The other thing you can see that it has a premium and rich looks. You can confirm it by just taking a glimpse of it. Also, if you have something important that you want to access immediately when necessary. Then it comes with one large zipper pocket and two U-shaped zipper pocket on the front of it. This can be quite useful in many cases. Briefly, if you are a business person or the type of person who rides airplane very frequently then blindly you can go with this bag. It is one of the premium bags prepared with the best quality materials. It delivers lasting performance and is highly durable. You can stuff it with numerous items and it will maintain its shape. The exterior big size pockets offer enough storage space for numerous stuff and documents. It is ideal for official and personal travels and offers lots of space for packing stuff of different sizes. Despite having numerous great features, it is prepared from fabric. Hence, lacks resistance from severe external damages. It is available in limited color options. 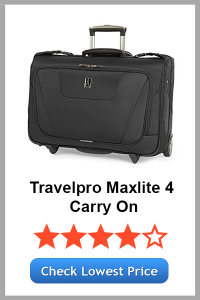 If you are our regular reader, you may know that we recently reviewed Travelpro Maxlite 4. It comes in 9 different variants, so select the garment bag. There are two variants: Rolling Carry-On Garment Bag and Bi-Fold Non-Hanging Garment Bag. Both bags are made up of 100% polyester. As like all the other bags it has the fabric lining. Both side inside and outside has a water-repellent coating. 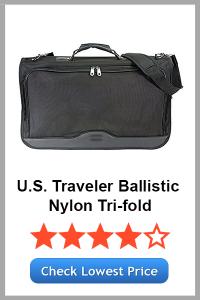 Just like most of the bags this bag is covered by Travelpro lifetime limited warranty. One of the major benefits of buying this bag is that it is often under heavy discounts and can be very budget friendly. 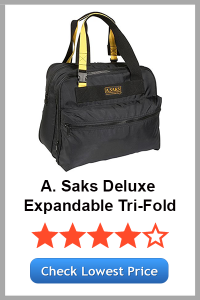 The best aspect is that this bag is available in 9 distinct variants. Hence, you can select the best option according to your preference. The bag is prepared from 100% polyester. This ensures that it offers lasting durability. With spinner wheels and a retractable handle, the movement is smooth and hassle-free. The big section in exterior ensures convenient packaging of additional stuff. The bag holds water repelling coating in the interior as well as exterior. It is available with lifetime warranty. You may not get all the features in one single variant. It features split spinner wheels which can adjust to almost any terrain. 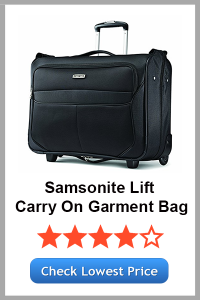 Just like Samsonite lift, it is also made up of 100% nylon. The fabric lining makes the bag shine so bright that it looks absolutely amazing. The four wheels mounted at the bottom of the bag makes it very easy to carry around. It is textured TPR coated, gel-infused, push-button locking handle provides a comfortable grip. Also, it is in the top 30 bestselling garment bags on Amazon. The spinner wheels are adjustable to all types of terrain. The gorgeous appearance and lasting durability make it a top choice among the masses. The textured exterior coating is unique and adds to the durability. The push-button lock handle ensures complete convenience during every travel. It does not support a bottom handle. The size is less spacious as compared to other bags in the similar range. Now coming towards the bag which does not have wheels and is ideal for carrying around & are compact in size. 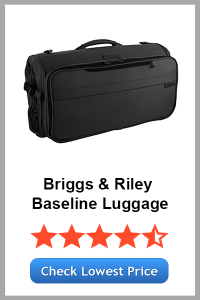 Here in this department, we loved the Briggs & Riley product as earlier. It is a very lightweight garment bag which can easily accommodate 5 suits easily. Quality and choice of the material is top-notch as always and comes with lifetime warranty. The only thing that can bother some people is its price. It is not very expensive but for sure it is out of the normal budget line. It is a very lightweight bag. The bag can accommodate enough clothing and hence is ideal for long travels. It is made of high-quality material and can offer you lasting usability. The bag lacks spinner wheels. It does not incorporate a grip handle. The look is simple and more like a laptop bag. If you cannot afford the previous garment bag and you are more of a budget person then believe us this one is for you. You can consider it as the best tri-fold garment bags in the budget line. Due to its affordability and high quality, combined it has more than 92% of satisfaction rate, which is very rare these days. The bag is made up of nylon and polyester. The weight of the bag is approximately around 5 lbs and is 14 inches high. 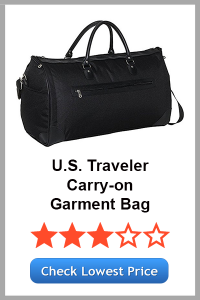 If you are an occasional traveler then you can't go wrong with this garment bag. For a bag this budget-friendly, you can't question the durability and quality of the product. You will just have to take care of it properly so it doesn't wear and tear fast. 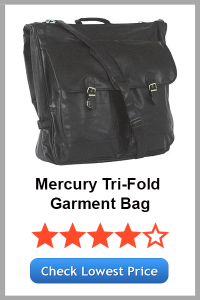 It is a trifold-garment bag available with a strap. Hence, you can carry it similar to a laptop bag. The bag has different sections to pack stuff in an organized way. It does not have spinner wheels and the grip handle. The exterior is not of much high-quality. From the image, you can see how simple this bag is organized. And this was one of the things that caught our eyes. You can just put your clothes and strap the bag and you are ready to go. Nothing like packing is necessary. So always keep it lock and loaded. It is a tri-fold bag offering enough space for packing stuff. There are multiple sections that can be used to pack big and small products. It is very lightweight and can be carried easily in the heavy crowd. It is perfect for small routes and single travelers. The adjustable strap allows the convenient carrying of the bag. The design is simple and nothing new. It is a regular bag not meant for long travels. Tumi and Briggs & Riley are similar in many ways if you check both of them side by side. It is an expensive bag just like their previous one. But you can be assured of the quality of the material and the service after the purchase if anything ever happened to your bag. This is something you should look out for if you are a person that travels a lot because traveling a lot can cause wear and tear easily. 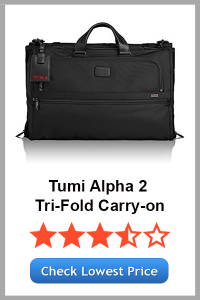 The one thing that you will love about Tumi Alpha 2 Tri-Fold bag is the weight. It is just 3.75 lbs and is extremely portable. Made with high-quality materials, it is possible to use this bag for long years. The bag is super stylish and prepared with high-quality products. It holds pockets of different sizes. This allows organized packing of different types of stuff with ease. It comes with a strap and handles that make it easy to carry. It does not wear and tear off easily. Hence, it is ideal for long travels. The bag is slightly expensive. It is a medium size bag. Hence, does not offer enough space for packing stuff. Now coming towards the end of tri-fold garment bags, this is our last choice that you can't go wrong with. This is the father of budget bags. You will be surprised to check out the price of this bag. This bag is for those who are not into traveling on regular basis. However, due to very low price, durability may remain a question. But who cares when you are getting it at the 1/6th of the regular price of premium garment bags. It is prepared from high-quality material. The bag holds excellent resistance to scratches and external damages. The strap is adjustable and offers absolute convenience while traveling. It does not have any exterior compartments or sections. It lacks spinner wheels and grip handle. Now coming on to the duffel bags. If you are a person who loves the leather product, then you are at the right place. 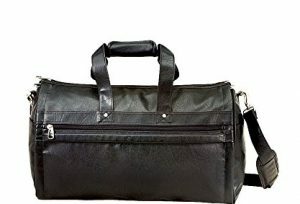 U.S. Traveler Koshkin garment bag is made of leather with the shiny and attractive design. The overall look of the product is eye-catching but when you look at it closely you can see the cheap quality of material used. But this is not the manufacturers' fault because the price is pretty low. Many customers have reported the problems with the zippers but this is not something you should be concerned about because we haven't found any evidence of this issues. It is a sleek and elegant bag styled to offer organized packing. With a handle at the top and adjustable strap carrying this bag is very easy. The big size exterior compartments offer enough space to pack other important stuff. It is lightweight bag offering lasting usability. The bag lacks spinner wheels. Hence, you cannot drag it. It can accommodate only light stuff. 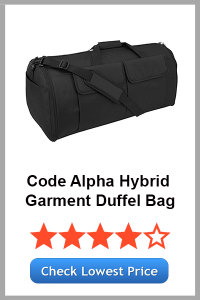 When you take a look at Code Alpha Hybrid bag, you can see that it bears a very simple and unique design. Many of the people look for something simple in their garment bags and love them. Similar to the other duffle bags it rolls over and wrapped to make it a duffle bag. It is 24 inches long and can easily accommodate your belonging for a week travel. Also, it weighs barely 4.4 lbs which are normal if you consider it's size. Extra pockets at the sides of the bag will help you to manage some of the things you frequently use. With elegant design and premium shape, it is easy to carry bag. There are additional side pockets that allow keeping small stuff with ease. The adjustable strap and top handle makes it easy to carry. The design is very simple and may not impress at first sight. If you are the one who falls in love easily with the black color then this is the one hell of a duffle garment bag for you. It's slick and pretty design says it all. Extra zipper at the side of the bag will provide your extra space to put things. The material used in the bag is strong canvas. However, we are not quite sure that how it will tackle the time. The straps on the bag seem okay. We think that this can be strengthed more if they want to. It is a lightweight bag. It is prepared from strong canvas, which is known for its durability and usability. The bag can even withstand the weight of a heavy stuff. There are no pockets and sections on the exterior. It does not have any wheels at the bottom. Hey there, are you up for a classy looking bag. 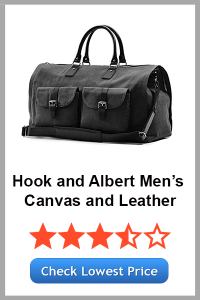 Hook and Albert Men's Canvas and Leather is one hell of a stylish bag but beware that this style comes with a higher price tag. Also, you can select from wide range of colors. This is not the case with most of the garment bags that we have seen earlier. Let us know what you think about the price and style ratio for this bag. It is a super classy bag that looks sophisticated. It is made of best quality materials. It offers lasting usability. It is available in various amazing colors to choose from. It is stylish and has pockets on the exterior that offers enough space to store additional stuff. The strap is adjustable and allows convenient movement. The bag is slightly expensive as compared to other products. The material used is dull finish. This is the first garment bag that we have discussed here that is made up of Tarpaulin that wraps around. The bag is very compact and can fit into the rules for any airlines. It is well made and frankly very durable. You can wear it using a single strap to your shoulder. The other cylindrical bag that is inside this bag can be used on its own if you ever want it to. Isn't that amazing? It is an excellent garment bag that offers lasting usage. The bag is compact in size and hence occupies less space. The grip handle is strong and comfortable. The bag is super-stylish and extremely durable. The bag does not have any sections at the exterior. It is available in the dull finish and limited color options. 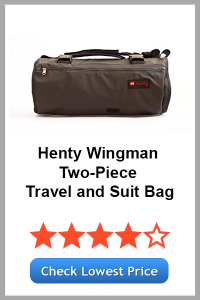 Yet it is another wrap-around garment bag that we have mentioned on the list. It is made up of polyester. Hence, it is cheap and you have to make it packed using the zips. Otherwise, your clothes will spread out in the middle of the market and that doesn't look good in public. It is a simple bad yet offer enough space to pack stuff. It comes with easy to grip handle that makes transportation easy. There are side pockets available in the bag that offers additional space to pack items. The bag may lack big exterior pockets to keep additional stuff. There are different types of garment bags available and hence it is essential that you pick a bag that is as per your requirement. For this reason, it is essential that you pick a bag that is able to render the purpose where you will be going. If you are using the garment bag for personal trips, then the size would not matter much. But if it is for your official or professional tour, then it is essential that you pick a bag of the right size. The size of your bag must be big enough to accommodate all your important stuff, documents, and items. There are tri-fold and bi-fold garment bags available. The bi-fold bags are ideal for everyday use, while the tri-fold bags offer you with more options to pack the clothes. 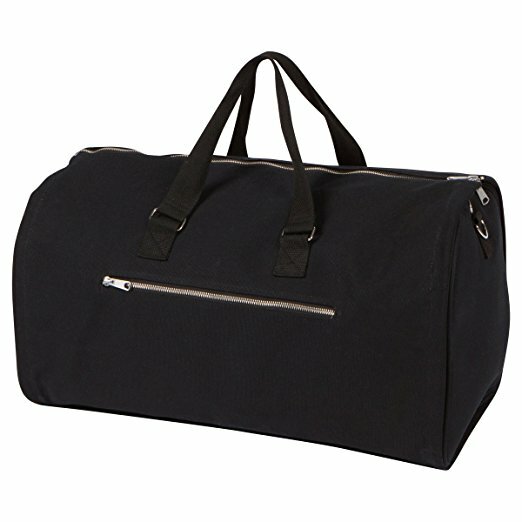 Roll up bags are also known as duffel garment bags and are best to carry when you have additional stuff to carry. It is important that you buy a bag of high-quality that is crafted with the best quality material. It is because only a durable material would be able to impart complete protection to your stuff. It is the only way to keep your stuff safe throughout the travel. Some bags have compartments on the inside, while there are others that have pockets in the outside. Hence, make sure you pick bags with appropriate pockets and compartments so that you can pack all your items with ease like shoes, accessories, and ties. Besides, the above features make sure you pick a bag that holds excellent resistance to scratches, water and other external factors. In addition to this, the bag must hold a support system that makes it easy to carry. If you are traveling for some formal and special occasion, then the first thing that comes to your mind is that whether the clothes will be as it is as was before packing(pressed). The normal bags can't do that, but the garment bags can. So these were our best picks for the garment bags. This list is not in kind of any order. So you can pick any one of them and you are ready to roll for your trip.